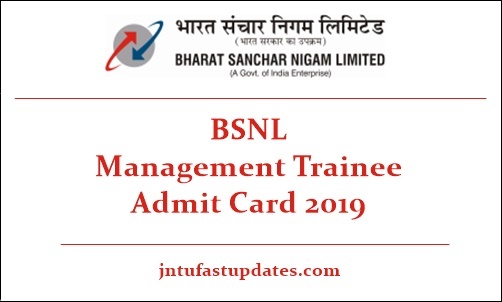 BSNL Management Trainee Admit Card 2019: Bharat Sanchar Nigam Limited (BSNL) has scheduled to conduct the Management Trainee written test on 17th March 2019. Applicants enrolled for the MT jobs in BSNL must have to get ready for the written test round. The BSNL has recently claimed that the competition for MT (Telecom Operations) posts is severed then the last year. Hence the competitors must prepare well to get good merit in the written test round. Before going to attend the written test, candidates have to download BSNL Management Trainee admit card 2019 as it is the mandatory document required to take part in the examination. Candidates will be allowed to the examination only after verifying their admit cards. The competitors must carry the admit cards to the examination without fail. The examination officers will allow the candidate to proceed with the test only after checking the hall ticket. Admit cards will be accessible to download at BSNL website, bsnl.co.in. Bharat Sanchar Nigam Limited is the state-run telecom department that is having millions of subscribers across the nation. The BSNL annually announces various recruitment notifications every year. The organization has recently announced a recruitment notification “74-1 (2)/2018-Rectt” on 11th December 2018 stating 150 Management Trainee [Telecom Operations] posts. For the announced posts the BSNL has accepted applications from 26th December 2018 to 26th January 2019. As BSNL is the central government organization, lakhs of hopefuls wishing to get BSNL jobs have applied for the Management Trainee posts during the application dates. Candidates will be shortlisted through an online assessment test, group discussion, and interview rounds. Candidates who clear all these rounds with good merit will be considered to recruit. Hopefuls applied for the BSNL Management Trainee posts 2019 will have to attend the written test round on 17th March 2019. Candidates have to download BSNL MT Admit card 2019 before 10 days of the examination. Tentatively, the hall ticket link will be activated on BSNL website, bsnl.co.in in the first week of March. Soon, the organization will reveal the hall ticket accessibility date. Competitors who are going to attend the examination can stay checking the BSNL website for more updates. Search the BSNL Management Trainee Hall Ticket download link in organization website. Check the information in BSNL Management Trainee Hall Ticket 2019.